South Africa's top service travel agency. Enjoy Russia on its waterways! See below for special offers from MilesAway. River cruising in Russia is peaceful and even beats ocean cruising. 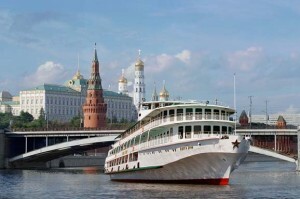 Cruises in Russia on the Volga River take tourists onto Europe’s largest and longest waterway. It is a very special way to experience Russia, and the specific route of the tour in this article holds a special place in Russian history and in the hearts and minds of the Russian people. The Volga River has actually been an important aquatic path through Russia since Medieval times. In fact, the Volga was the top route for business, trading, met with many villages and hamlets, and even hosted a number of battles. Peter the Great sailed along the Volga from Moscow to St. Petersburg approximately 300 years ago on a quest to bring Russia out of the Dark Ages. Not to forget that the Volga is mentioned in countless texts and literature written for the last few hundreds years. So with that in mind, now is the time to get on a boat and explore Russia. The specials listed below are for the tour now described. You fly to and start in Moscow, where while still on land, you will get to views the sights, such as the Kremlin, the Red Square, St Basil’s Cathedral. 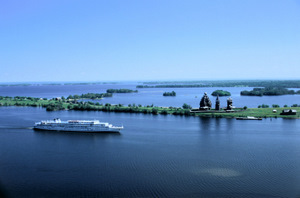 You then climb aboard the cruise to do the Golden Ring, a majestic waterway network showing numerous ancient monasteries and white stone churches, in towns such as Vladimir, Uglich and Yaroslavl. On Kizhi Island you can experience daily life in Russia with a visit to the Children’s House of Arts and Crafts, and another tour to Mandrogi, a reconstructed old Russian village. After being in all these wonderful places, the cruise tops off by ending in gorgeous St Petersburg, with ballet and the Hermitage Art Museum taking you to the heights of Russian traditions and royal history. A Russian Volga river cruise is relaxing and unique! The kind of traveller that would typically choose this cruise is that of someone wanted to take as much of Russia in during a rather short space of time. The cruise includes some of the world’s finest art and some pretty distinctive architecture, as well as special on-shore visits to hidden villages with a rather rustic Old World atmosphere. Many people who have been on river cruises as well as ocean liners will tell you that the movement of the sea impacts on your trip, and that river cruises in Russia are a majestic way to experience the country. Book and deposit at time of reservation to SAVE R5,000 per couple (R2,500 per person) on 2013 Russian Boutique River Cruises. This offer expires 15 January 2013. Pay in full when booking to SAVE up to R14,000 per couple (R7,000 per person) on 2013 Russian Boutique River Cruises. Offer expires 31 October, 2012. MilesAway Travel and Flights is South Africa's only 24/7 travel agency, with a consultant available all day for business and personal travel needs. Feeling adventurous? Take a flight to Russia! We've used MilesAway ever since our trip from France to South Africa, and always phone when travelling anywhere. We've never met anyone from MilesAway, but that didn't stop them from helping us greatly. In our company we struggled with travel, because we would be in China for example, and have a problem with changing our flights, or need to add some accommodation to our booking, and our travel agents were always unavailable. MilesAway is a breeze. One call, and everything is handled efficiently. No hassles, just feedback and service. We've never looked back! Superb, fantastic - helped us out at the direst of moments and we'll use them again any day! In our industry, our employees fly often and also after-hours, so we were happy to find MilesAway who could assit us anytime of the day. Perfect service! Milla, many thanks for the excellent service and quick turnaround time when arranging our team incentives. It is really difficult to please everyone on a group incentive and I was able to pull it off with no complications and only great reviews, thanks to you. I just wanted to take this opportunity to say a BIG THANK YOU for everything and specifically for having the patience and attention to detail with all the changes. I really enjoy working with people who are professional and reliable, and you are definitely both. Working with you is a pleasure and I look forward to working with you in the future. I would like to thank and congratulate Milla from MilesAway for her prompt and excellent service! Trust a man to ask his wife at 5pm to arrange him a flight from George to Cape Town for the earliest leaving plane the next morning - I know, almost impossible! Thank goodness for Google -this is where I found MilesAways' info, I sent an email containing my enquiry and within minutes I received a reply from Milla. She managed to secure a ticket as requested and my payment and booking was almost effortless. She kept me informed both telephonically and by email and by 9pm she mailed me his e ticket! Amazing! This was not the end, darling husband missed his flight, I know, couldn't believe it myself. I contacted Milla, calmly and once again promptly, she arranged for another flight, which he decided not to take. Her last correspondence to me was stating that we had 3 months to change and use the flight ticket. Now this is what I call excellent service, so next time make sure you contact Milla, because MilesAway IS the way to go... Anywhere!!! Firstly, we would like to thank Milla for all her hard work, time and efforts, she is really fantastic and has gone out of her way. She managed to find the best hotels, itinerary and options within our budget for a 3 week holiday to the USA in December. I would definitely advise anyone travelling to chat to Milla first. Thank you, Miles Away and looking forward to our best holiday yet!!! My husband and I went to Mauritius for our honeymoon in March and we couldn’t have been happier with our hotel and how easy it was to book everything with Miles Away! Our transfer was quick and easy with our own personalized driver. Once we arrived at the hotel we were welcomed with drinks and very kind staff at the Paul Et Virginie Veranda Resort. We were also given a candlelit dinner for our honeymoon and fresh fruit and champagne on arrival. Our room was lovely and clean and we got to enjoy some beach activities that were included such as snorkeling and paddle boarding. Overall a wonderful experience that we will never forget! We are so happy that we went through Miles Away. We will definitely be using them again and would recommend Miles Away to everyone! MilesAway Travel Agency specialises in travel and tours to Russia. Whether it’s flights, tours, cruises or accommodation in Russia, we can offer bespoke and group options. We deal with individual and corporate requests.